Stand on left leg with knee soft, stay tall. Line up with planted foot centered at #2 on board. 1. 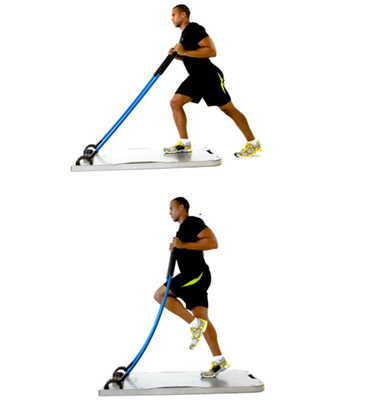 With both hands on Stix drive hands forward while at the same time shift hips backward. 2. Release left hand, drive right hand across body while shifting hips backward. 3. Switch hands, drive left hand across body while shifting hips backward. Stand feet parallel (12 o’clock) facing the Stix, right hand at position 1. 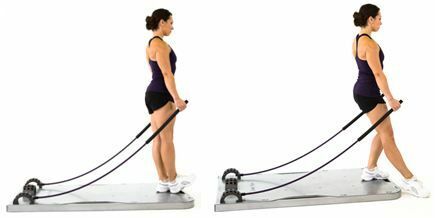 With right leg, take a step back (right foot to 4 o’clock), externally rotating from the hip to end in a 45° squat, while simultaneously rowing the handle in toward the chest. Make sure to keep spine stable; there should be no rotation between pubic bone and sternum. 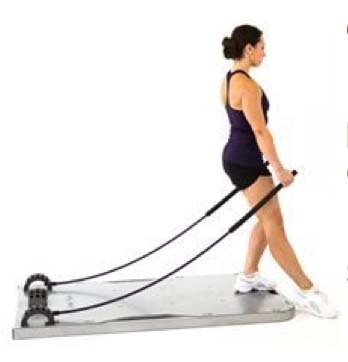 Complete by returning to a standing position. 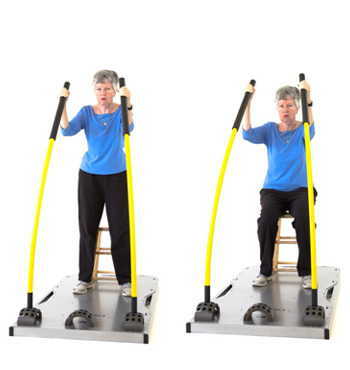 Stand feet parallel, knees soft, core engaged, and hands at position 1. Pull Stix slightly back at the start position. 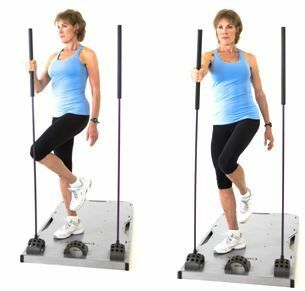 Using the Stix as a counterbalance, sit back into a squat. Keep spine neutral, weight on heels. 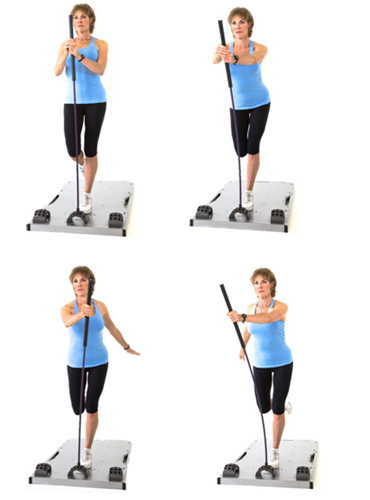 Stand with Stix close to shoulders, hands at positions 2-3. Walk feet back until body forms a 45° angle, reaching one leg back slightly, weight on balls of feet. Feet flat on board, knees bent at 90°. Grab Stix in a low position. Initiate movement by curling pelvis up, peeling spine off the board one vertebra at a time. 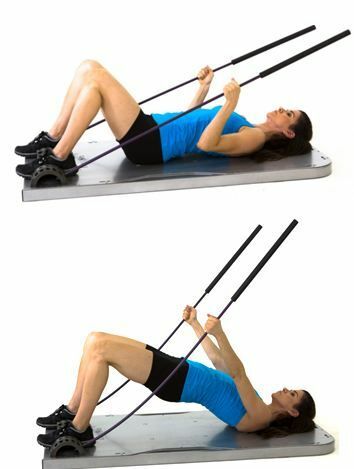 While squeezing the glutes at the peak of the exercise, perform a chest press. Release Stix and uncurl spine to starting position. Do not arch spine at the top of the position. 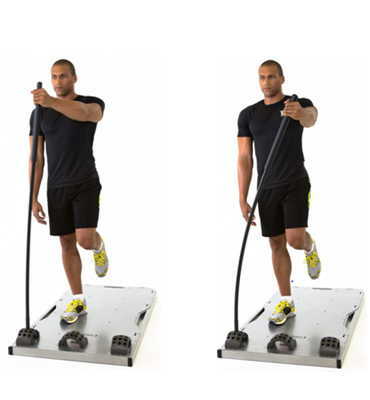 (Progressions: a) Unilateral Leg; b) Unilateral Arm; c) Unilateral Opposite Arm and Leg). Feet flat on board, knees bent at 90°. Grab Stix at position 2. Initiate movement by curling pelvis up, peeling spine off the board one vertebra at a time. 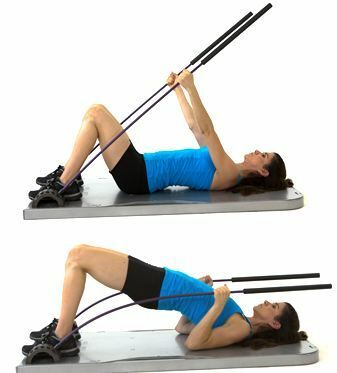 While squeezing the glutes at the peak of the exercise, pull Stix into a row. Release Stix and uncurl spine to return to starting position. Do not arch spine at the top of the position. 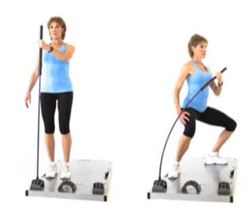 (Progressions: a) Unilateral Leg; b) Unilateral Arm; c) Unilateral Opposite Arm and Leg). Stand on right leg, do not lean body to the side. Starting with the right hip slightly internally rotated, body turned to the right but knee stays straight ahead. 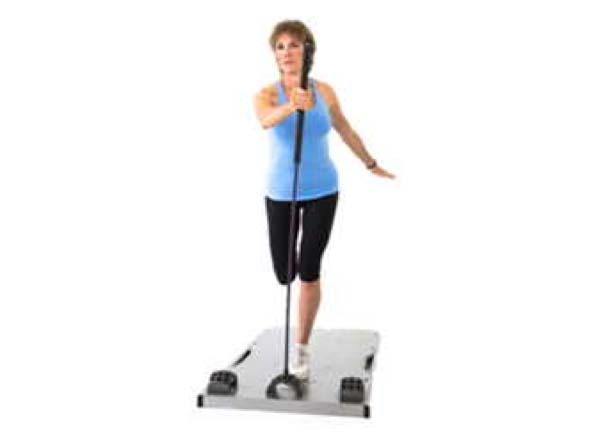 Stand on right leg only, facing the Stix. Grab left Stix at position 2. Left Arm: Keeping the left arm straight, bring Stix away from body. Be sure to stay tall on right leg. (Activating Glute Med.) Right Arm: Keeping right arm straight, pull Stix toward the midline of board. Be sure to stay tall on right leg.